This piece is made with ivory waxed cord in combination with black satinique cord. The length can vary from about 16 1/2 to 19 1/2 inches with a center jeweled piece that adds 2 1/2 inches. 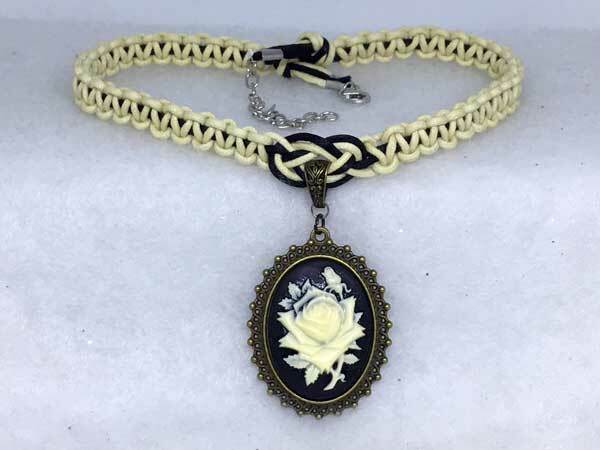 The beautiful pendant is vintage-looking cameo pendant with an beautiful ivory rose set on a black background. It is finished in antique-brass-looking setting. No complimentary beads needed to be added to this one. It speaks for itself!